Four days ago we published the news that our figures for tracking what Openreach is up to had passed the 1 million mark and now Openreach has announced that they have more than 1.2 million premises across the UK where people can order a full fibre service. We should point out this does not mean they've added 200,000 premises in four days since it takes us time to spot and check the various roll-outs. The last Openreach declared figure was 893,000 at the end of December so this suggests a roll-out pace of around 25,000 premises a week, somewhat higher than the 14,000 mentioned in the press release, but the press release does say more than 14,000 and since the pace is going to ebb and flow slightly using a lower figure makes perfect sense. For the those living in the one millionth home to be passed Openreach is funding a year of free FTTP broadband and the picture shows the family along with their pleothora of devices on the day they were actually connected. For avoidance of doubt a property being passed is different to being connected and we await the financial results in a few weeks to learn how many more are subscribing to the FTTP services compared to the last quarter. 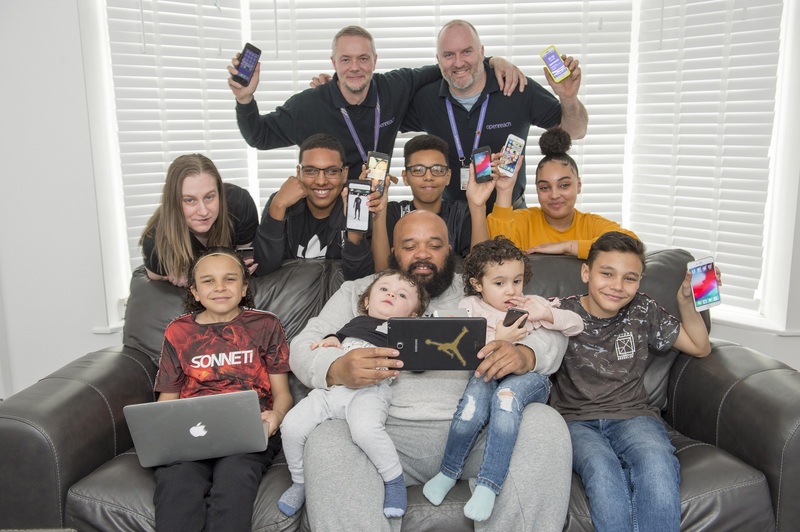 A family in Leeds with all many of their devices happy now they have full fibre and everyone can be online at the sametime. Getting fibre broadband has made a massive difference already but being able to get it free for a year is brilliant news. With a family this size, getting online at the same time with our old broadband was just impossible, there was constant arguing and moaning. But since the new fibre was switched on I’ve not heard a peep out anyone. Our old broadband service used to lag and freeze as soon as more than one person tried to download or stream anything. But now it’s amazing, everything is instant, no matter how many of us are online at the same time or what we’re doing. There is good news for the roll-out as we now know 12 more new locations which will receive the Fibre First treatment, and these are Stockport and a number of locations in Northern Ireland, namely Armagh, Bangor, Ballymena, Greater Belfast, Coleraine, Derry-Londonderry, Enniskillen, Lisburn, Larne, Newry and Newtownards. For those worried that Openreach who now are building very fast which is no doubt helped by concentrating resources in specific areas rather than following an on-demand agenda the CEO of Openreach does address this issue and with 1,400 of the 3,000 apprentice engineers already hired the company is scaling its workforce to not only roll-out at scale but also connect homes and businesses. None of this would be possible without our engineering workforce – which is why it is fantastic to see so many new people wanting to join the country’s largest team of telecoms experts working to expand, upgrade, maintain and install services over Openreach’s national broadband network. We have not stood still in our spotting of the roll-outs, four days ago our figure was 1,003,094 Openreach premises passed then a day ago it was 1,017,361 and today we are showing 1,020,957 premises. So clearly still a lot more to find and therefore we will continue searching as we believe its important to spend the time doing this work to validate the roll-out for Openreach and the other full fibre providers. Tuesday 9th April: To further illustrate the pace at which FTTP is appearing our tracking is now sat at 1,027,971 just 24 hours later. There is also first glimmer of Fibre First activity on the Davidson Mains exchange in Edinburgh as parts of the cabinet 14 area that never had VDSL2 now has FTTP available. 'tie a knot in it' springs to mind.